We are all set for the 2nd #RepealPH day! The event will highlight the public reporting of policies and regulations for repeal, amendment, consolidation and delisting. Project Repeal aims to eliminate outdated laws and/or issuances that place a heavy regulatory burden on businesses and add to the cost of doing business in the country. 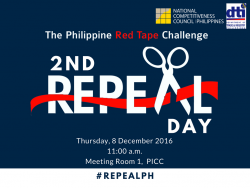 From the eight initial agencies who joined the first Repeal Day last June 13, 2016, more than 20 national government agencies are expected to participate for this round. Joining the 2nd Repeal Day are Senator Juan Miguel Zubiri, Chairman of Senate Committee on Trade, and Congressman Ferjenel Biron, Chairman of House Committee on Trade, and heads of agencies.